Today we drove to Fuente Dé at the end of the valley and took the bright red cable car up into the mountains. It has been another beautiful day with clear blue skies and we wondered whether there would be a long queue (in high season I gather you get a number and have to wait until you are called) but we only had a few cable car’s worth to wait in a very pleasant shady spot under pine trees. 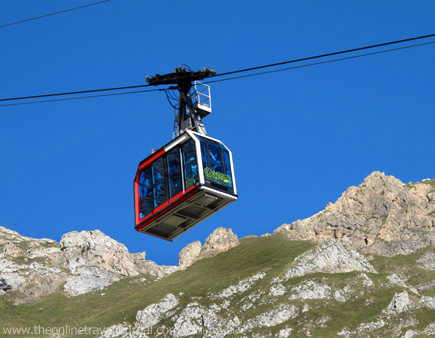 I was a bit apprehensive, it is a long time since I have been in a cable car and this one looked altogether smaller and lighter than the solid cabins I remembered. In fact the ride was thrilling; short and steep rising out of the valley above green pastures straight to the bare limestone cliff above where you seem to climb almost vertically up the rock face. The panoramas from the viewing platform on the cliff edge at the top are wonderful. 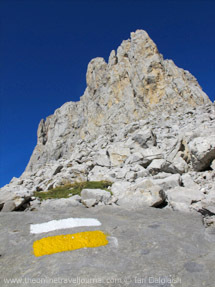 There are two well marked walks from the cable car station here, one heads westwards climbing higher into a limestone landscape and the other winds down past the former royal hunting lodge, through upland pastures to the valley below – the track for this route is wide, indeed usable by 4-wheel drives but fortunately there was only one ferrying people up and down in a seemly manner. We walked a way enjoying the views and the peace of the mountains.